Years ago, scholar Susan Weingarten first took the dive into the who, what, when, where and why of ancient people’s diets after reading an academic tome that neglected detailed accounts of the foods they ate. But Weingarten, a senior researcher in archaeology and Jewish history at Tel Aviv University, in fact knew what these Jews consumed from her years studying the Babylonian Talmud. What followed were books in which she explored ancient Jewish foodways, for example, The Qederah: The Everyday Cooking Pot of Talmudic Time and Ancient Jewish Sausages. New for Passover, Weingarten breaks down the history of haroset and its many variations in her latest book, Haroset: A Taste of Jewish History . The thoroughly researched, entertaining work is food for thought for those curious about the Passover symbol essential to the modern seder yet mysteriously missing from early Passover seders—appearing as an element on the seder plate only much later on in the Babylonian Talmud. I sat down to talk to Weingarten about her book, her favorite Passover foods, and the power of tradition, something she finds extraordinarily fascinating in her work and findings. 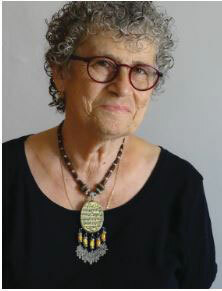 Weingarten made aliyah from England in 1973, with her husband and young child. Hailing from a little-known corner of England near Liverpool, she grew up in a small community of 40 Ashkenazi families. 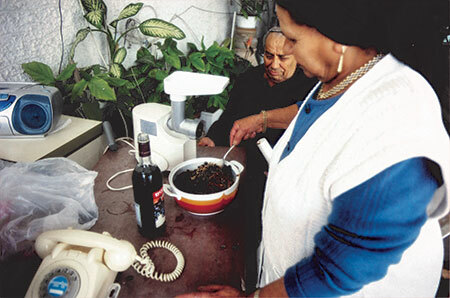 Weingarten’s home was regularly filled with the aroma of the more exotic side of Romanian Jewish cuisine, largely unknown to her Jewish neighbors. It’s this foot in both the Ashkenazi and Sephardi worlds and her deep understanding of medieval and ancient Jewish history that makes Weingarten the perfect explorer to chart the story of haroset. Among the most interesting iterations she has encountered is one that includes ground-up pottery or brick dust. Jews in her hometown in England, as well as elsewhere, have been preparing this for centuries in accordance with the words of an 18th-century rabbi who added it to his recipe as a symbol of the Egyptian mortar. Another unusual haroset ingredient is hyssop, found in Maimonides’ medieval prescription for the mixture. Weingarten believes the hyssop to be a nod to the fragrant za’atar plant that the Israelites used to paint lamb’s blood on their doorposts during the last plague. The recipe for my own haroset was passed down by my mother Esther Shannon, who inherited it from her mother Cecilia Pomerantz, née Herscovici. At the turn of the 20th century, my grandmother moved from Romania to London, where she married my grandfather, who came from Russia. My grandmother’s haroset was the standard Ashkenazic version. My mother grated her apples on a coarse hand-grater. She chopped the nuts in a wooden bowl with a mezzaluna chopper, as well as raisins if she could get them—raisins were not always available with a “Kosher for Passover” label in postwar England. The 15th-century Leket Yosher had banned the use of dried figs or raisins on Passover for fear they may have been dried with flour. Depending on the type of apples I use, this haroset is not always sweet enough for my family, so I add sugar to taste. If the mixture is too wet, I add some of the grated coconut, always on hand inmy kitchen at Passover. Blend all the ingredients except the pomegranates. Add the pomegranates, either with their seeds, or sieved to get rid of them, depending on the tastes of the people present. Linette née Cohen is from Jerba in Tunisia. Jerba is an island where there is community of Jews who are all priests (kohanim). 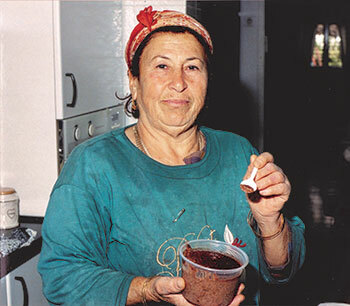 “I used to be a kohenet (female kohen),” she said, “but I gave it up when I married a man who was not a priest.” Linette makes her haroset of the consistency of chocolate spread, without oil, as it is already very heavy. She adds her own spices, but told me that you can now buy ready-made “spice for haroset” sold in the shop by weight. She only adds sesame to half the quantity because not all the children like it. She kneads her haroset and serves it as balls (just as we saw in some medieval Haggadahs). Grind dates, nuts and raisins finely with meat grinder. Add grape juice or sweet wine and oil if desired. Add a small amount of spices, and sesame if desired. Knead, and serve as balls.